MK Battery U-1 Sealed Gel Battery Model 8GU1. Genuine MK Battery MK U-1 Sealed Gel. 36-Amp Hour at 100-Hour Rate. 31.6-Amp Hour at 20-Hour Rate. Made in USA by East Penn Mfg. Battery-Powered Mobility Systems provide thousands of Americans with additional FREEDOM and INDEPENDENCE. But none of these Ingeniously designed Vehicles can perform to its Full Potential without a Top-Quality Battery as its Fuel Source. In fact, Choosing the right Home Medical Equipment (HME) Battery can actually Enhance Your Mobility Equipment's Performance and Safety, Simplify Charging and Maintenance and, in the Long-Run, Save you Time, Money and Peace of Mind. 23 Lbs. Price is for one battery. 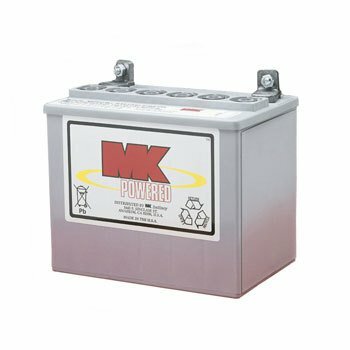 If you have any questions about this product by MK Battery, contact us by completing and submitting the form below. If you are looking for a specif part number, please include it with your message.